KMK offers the following solutions to the provision of a secure management service of hard disk drives (HDD’s). As the leading electrical and electronic waste recycler in Ireland, KMK has a substantial processing facility. 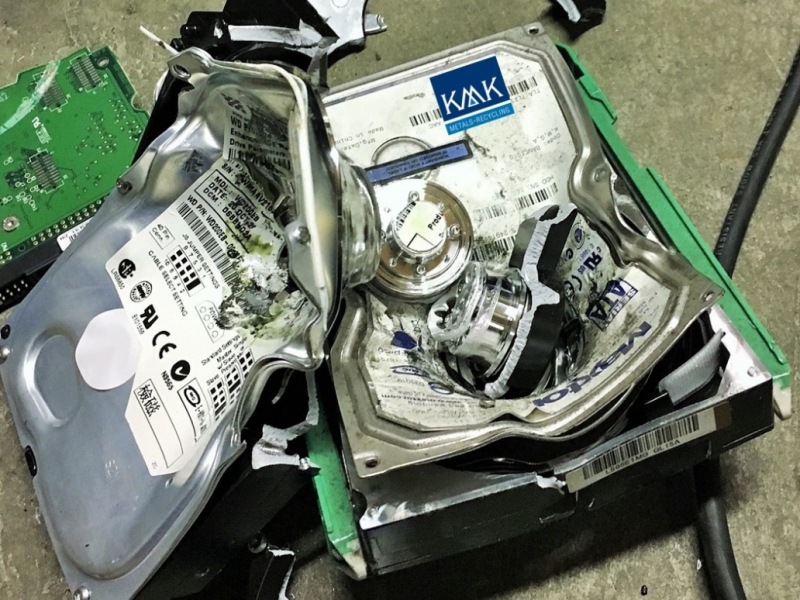 Bulk hard-drives can be delivered or collected by KMK and put through our extensive shredding and mill system. This activity can be witnessed directly or by a 3rd party security company. The Portable Hydraulic Punch provides destruction of your hard-drives under your witness. Ready to operate within minutes, KMK trained operatives will operate the equipment and only require access to a power source (220v). After each HDD has had its serial number/asset tag recorded (optional) the units are individually placed into the hydraulic punch. HDD’s are inserted in the hydraulic punch one-by one. The door is closed and this allows the remote control to begin the punch process. (As a safeguard to prevent unintentional harm, the door must be closed or the punch cannot operate). For interim storage solutions and reverse logistics with subsequent witness of secure destruction/shredding at KMK, we can provide lockable and sealable bins. Security in transit is emphasised with collections carried out by experienced and trusted KMK drivers in vehicles which are tracked by Fleetmatics™. KMK can, on request offer a solution which combines complete data security with value return for remastered drives. Data is securely and completely erased without physically destroying the drive. The system uses the highest level of data sanitization and overwriting standards with multiple reporting and comprehensive evidence that data is irretrievable. Once cleansed, thorough testing determining the condition and function of the HDD allows grading and resale. Participation in the sale is offered to clients, changing what can be an expensive procedure to a value-added activity while simultaneously optimizing the recycling and recovery hierarchy.